Italian composer. He is recorded as a singer at Tivoli in 1623; two years later he was organist there. His first appointment as maestro di cappella came in 1628, at the S. Rufino Cathedral in Assisi. The following year he was callcd on by Bernardino Castorio in Rome to fill the post of maestro at the German College there, a prestigious post in which Victoria and Agazzari had served earlier. Carissimi spent the rest of his life at the college; he was ordained to the priesthood in 1637. His responsibilities included training the choirs and providing liturgical music for the adjoining S. Apollinare chapel; his official salary of 5 scudi (in 1634) probably reflects only a fraction of his actual income. In 1655-56 he was given the title maestro di cappella del concerto di camera by the Queen of Sweden in exile in Rome; also during the 1650s he composed and conducted for the Oratorio del S. Crocifisso. Among his prominent pupils were Marc-Antoine Charpentier, Johann Kaspar Kerll, Christoph Bemhard, and possibly also Johann Philipp Krieger. That he was in a comfortable situation, both financially and professionally, is suggested by his rejection of several opportunities for prestigious employment, including the post at St. Mark's in Venice on Monteverdi 's death in 1643 and the position of maestro for the emperor's son, Leopold Wilhelm of Brussels. Carissimi chose to remain in Rome, and after 44 years of service to the College he died a rich man. 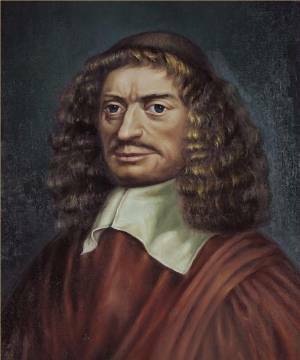 The first major composer of oratorios, Carissimi helped form the modern notion of the genre. He also composed hundreds of motets and cantatas in addition to Masses and other sacred works. Because no autograph manuscripts survive, problems of attribution in his oeuvre are especially difficult, as are problems of genre, especially in distinguishing between motet and oratorio. Among the oratorios are Damnatorum lamentatio (1666), Jephte (before 1650), Jonas, and Judicium Salomonis.